Philadelphia, PA – Community leaders and activists from across the Philadelphia area praised the Philadelphia City Council’s resolution today opposing Pennsylvania Act 13. The resolution opposes Act 13 and affirms the Commonwealth Court’s decision to strike down a portion of that law that attempted to strip all state municipalities of their ability to protect the health and safety of their residents by passing bans, moratoria, or even the most moderate zoning restrictions on any aspect of heavy industrial shale gas drilling. Councilman Curtis Jones, Councilwoman Blondell Reynolds Brown, and Councilman Kenyatta Johnson co-sponsored the resolution. 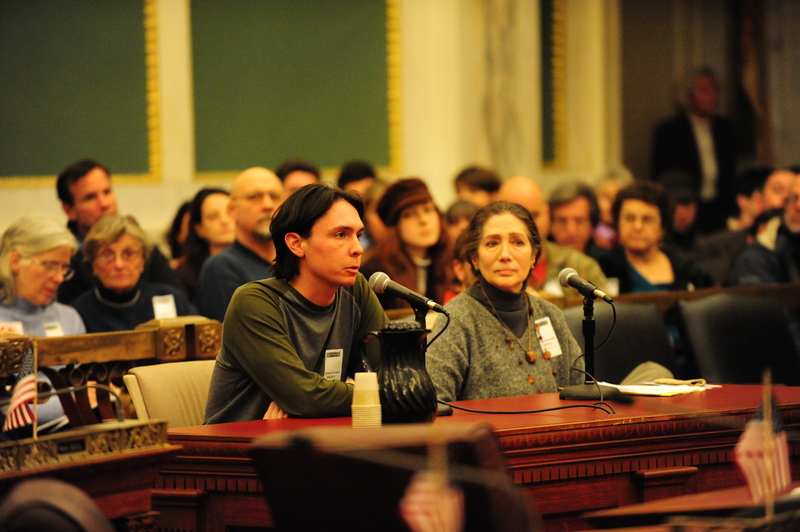 Up to 200 opponents of shale gas drilling have attended several City Council hearings in Philadelphia, including one in March 2011 focused on pressing the Delaware River Basin Commission to maintain its moratorium on fracking. The resolution approved by City Council today supports the Commonwealth Court decision which found Act 13 unconstitutional because it removes the ability of local governments to legislate to protect the health, safety, and welfare of its residents with regard to gas and oil operations. The legal challenge to the law was brought by seven municipalities, the Delaware Riverkeeper Network and Dr. Mehernosh Khan in March of this year. In July, the Commonwealth Court declared the municipal preemption provisions of Act 13 null, void, and unenforceable and allowed an injunction on its implementation to remain in place while the case proceeds to the Pennsylvania Supreme Court. Philadelphia City Council joins over 70 local government units supporting the overturning of the law and several “Friends of the Court” who have filed amicus briefs in defense of the Commonwealth Court ruling. “Philadelphia City Council has taken decisive action today to protect the drinking water for its residents and the region by casting a vote against Act 13, the law that pushes gas and oil operations into every corner of every municipality in the state. The City is throwing its support behind the communities of Pennsylvania instead of drilling and fracking special interests. This critical support is much appreciated as we go to the Supreme Court to defend the overturning of Act 13,” said Maya van Rossum, the Delaware Riverkeeper, an original plaintiff in the lawsuit. “City Council’s vote to oppose Act 13 sends a clear message that Philadelphia defends a Pennsylvania municipality’s right to make decisions that protect residents’ public health and quality of life. City Council recognizes how imperative it is for local governments to have the power to decide where, or even if, the shale gas industry can operate equipment that emits air pollution in people’s backyards and that accelerates climate change,” said Matt Walker, community outreach coordinator with Clean Air Council. Complete text of the Resolution is available from City Council and is also here.